George Graham Reviews Kami Lyle's "Blue Cinderella"
The ranks of notable singer-songwriters seems to grow every day. And once again we have a very memorable debut release of someone who writes literate, musically sophisticated songs and sings them appealingly. But in this case, instead of the usual singer-songwriter-guitarist, we have a singer-songwriter-trumpet player, and a fine one at that. 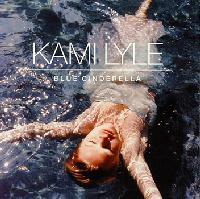 Her name is Kami Lyle, and her debut release is entitled Blue Cinderella. Twenty-nine-year-old Kami Lyle's journey to her debut album is an interesting one that in some ways sheds light on her music. She was Born in Minnesota, as Kimberly Howg, to a mother who was a classically trained pianist and saxophonist. As a ninth birthday present, she requested a trumpet, and was told that she would have to choose between Girl Scouts and music, and she chose the latter. With not many girls her age in her neighborhood, she often relied on music from the radio for solace, and was drawn into it. In junior high school, her trumpet teacher played in a salsa band, so she soon started hanging out with him, sneaking into clubs, and after a while eventually sitting in with the band. She writes "By the time I graduated from high school, all my friends were older jazz musicians. I'd ... do my homework in the back of the bar." One of the people her musician friends turned her on to was jazz Chet Baker, the late jazz trumpet player and some-time singer. At age 16, Ms. Howg adopted her stage name one day when, while working in a bookstore, she reached the into a drawer and pulled out the wrong name pin. It said Kami, who was a young Iranian-born man who had previously worked at the store. She added her father's first name as her last, and became Kami Lyle. Eventually, she enrolled in the Berklee College of Music in Boston, where her majors were jazz composition and performance, until her senior year, where she suddenly fell in love with song- and lyric writing, and changed all her courses, though she hadn't really been into singing. But when she found out about a Christmas bell-choir concert that "paid a lot," as she described it she auditioned for a singing part and got the job. After graduating from Berklee in 1992, she decided she wanted to move to Nashville, and after working as a live-in nanny to build up some cash, she took the plunge and in the Tennessee capital worked the proverbial day jobs, thirteen in all, she says, from waitressing, to being a long-distance operator to packing groceries, some of which provided inspiration for her songs. She was playing in a band in Nashville with guitarist David Steele and bassist David Jacques, when she was signed by a record company, and all agreed to enlist Sting's producer Hugh Padgham for her CD. The result is a really outstanding album, by a fully-formed talent delivering her sophisticated jazzy songs in a memorable voice that is somewhere between Edie Brickell, Suzanne Vega and Rickie Lee Jones. Making Blue Cinderella even more of a treat is Ms. Lyle's superb wordcraft: Her songs can be witty, melancholy or insightful while delivering some particularly astute poetic imagery. In addition to Steele and Jacques from her own band, two veterans of Sting's band appear, including drummer Manu Katché and guitarist Dominic Miller. Also appearing among the impressive lineup is Nashville pianist extraordinare Matt Rollings, known for his jazzy work with Lyle Lovett. Ms. Lyle does play her trumpet frequently, and naturally, that imparts a jazzy quality to her songs and arrangements. Most of the album was recorded in New York, though parts were done in Nashville and London. Kami Lyle's new debut album Blue Cinderella introduces us to yet another superb singer-songwriter of which there happily seem to be no shortage, and in this case, one whose main instrument in the trumpet. A lyricist whose words reveal something new at each hearing, and an engaging singer whose voice seems to wrap around the styles each of her songs take, Ms. Lyle creates music that is memorable and immediately appealing. The album boasts fine production by Hugh Padgham and the blue-chip backing musicians. Sonically it is also first-class. While the literate singer-songwiter has largely disappeared from the commercial pop charts, the season has produced a bumper crop of them. So the standard continues to rise. Good singer-songwriters are out with records wherever you look, really good singer-songwriter releases are also getting to be fairly commonplace, and artists who might have been considered genuinely astonishing a few years ago are appearing with a degree of regularity. I would put Kami Lyle in the latter category, an artist of exceptional talent, with a very impressive recording. I just hope it doesn't get lost in the shuffle.